This delish take on a hot dog was a "recipe of the month" for August 2015 from the Made in Oklahoma Coalition. This jazzy hotdog was featured as a "recipe of the month" for August 2015 from the Made in Oklahoma Coalition. Heat outdoor grill to medium heat. Quarter bell peppers and onion. Rub with olive oil. In a medium bowl, combine Daddy Hinkle’s marinade, honey, vinegar, salt and pepper. Set aside. Place hot links on grill, about 8 inches from the heat. Cook 8 to 10 minutes, turning frequently to prevent burning. At the same time, grill peppers and onions, about 2 minutes on each side or until tender. Remove from heat. Cut each sausage lengthwise. Slice peppers and onions into strips. Place hot links and peppers and onions in bowl with the Daddy Hinkle’s mixture. Spoon mixture over all to thoroughly coat. Place buns on grill to lightly toast, about 1 minute. Remove from heat and spread inside of each bun with butter. Fill each bun with hot links, peppers, onion and Suan’s® Scotch Bonnet Pepper Relish. Finish with Suan’s® Scotch Bonnet Pepper Relish! Soak mesquite chips in water to cover for 1 hour, drain well. Prepare barbecue grill, lighting fire at one end only. Rub brisket with Dry Rub. When coals are white hot place meat over coals and sear 5 minutes on each side. Move meat to side of grill away from fire. Spread 4 cups mesquite over coals. Cover grill. Smoke brisket 1 hour; maintain temperature at about 200 degrees, sprinkling mesquite with water occasionally. Spread remaining 2 cups mesquite over coals and continue smoking meat 1 hour. Preheat oven to 200 degrees, cut ½ cup fat from brisket and reserve for sauce. Spread 1 teaspoon of Suan's® Scotch Bonnet Flavor Sauce on each side of brisket, wrap beef tightly with heavy-duty foil, place in 9” X 13” baking pan. Bake 8 hours. Slice meat across grain. Serve hot, pass the sauce separately. ½ cup beef fat reserved from Barbecued Beef Brisket, remaining can be frozen for future use as stock. Cut fat into ½ inch pieces. Heat in heavy small skillet over low heat until rendered, stirring frequently, about 30 minutes. Transfer ¼ cup melted fat to heavy medium saucepan. Stir in remaining ingredients and cook over low heat until thick, about 1 hour. Serve sauce hot or warm; refrigerate any leftover sauce for future use. Grill Chilean Sea Bass with the skin side up for 3 to 4 minutes; turn and grill until the flesh flakes with fork (about 3 to 4 more minutes). 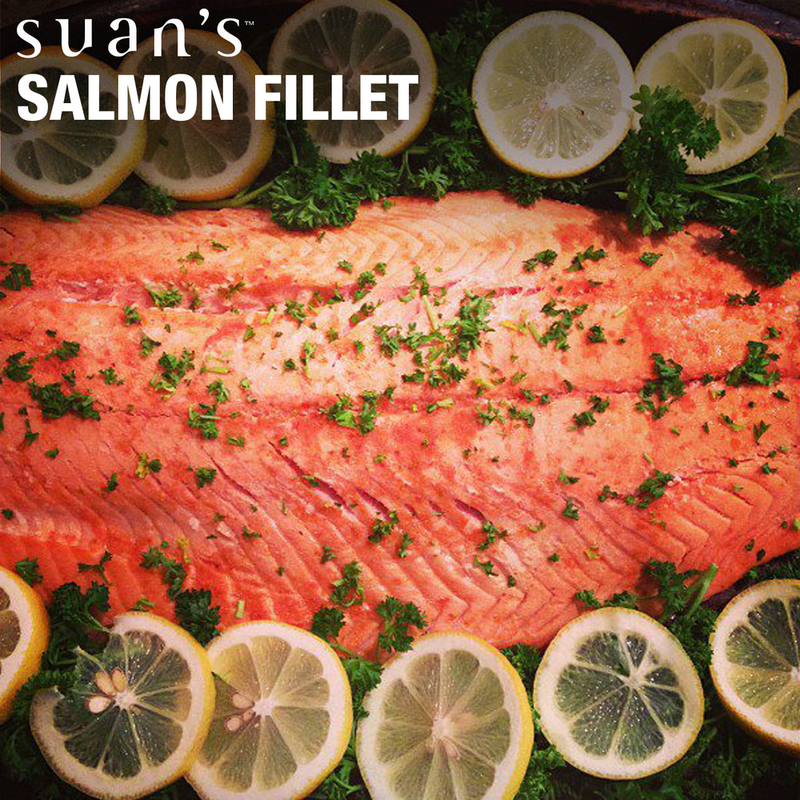 Top with Suan’s® Scotch Bonnet Mango Lemon Fruit Butter place under grill until topping bubbles. Mix flour, salt and cheese well. Cut in butter and cream cheese. Divide into 4 equal balls. Wrap in waxed paper and refrigerate. Chill for 2 hours or overnight. Fresh herbs may be mixed into dough, if desired. Brown chicken breasts in olive oil. Remove chicken from skillet and brown onion, garlic, and ginger root quickly. Add Suan’s® Scotch Bonnet Mango Lemon Fruit Butter, lemon juice, Suan’s® Scotch Bonnet Flavor Sauce, and Dijon mustard. Bring to a boil, then reduce heat to simmer for 5 minutes, covered. Fill pastry rounds and bake. Also try this recipe for Suan's® Beef Empanadas. Mix ingredients. Form 4 to 6 patties and keep refrigerated until ready to grill. Place on grill and cook to desired doneness. Top with Swiss or cheddar cheese if desired. Serve with Suan’s® Scotch Bonnet Pepper Relish, tomatoes, lettuce and purple onion slices. Add mustard, ketchup and mayonnaise as desired. In heavy skillet or dutch oven with oven proof handle and lid, add 1 to 2 tablespoons of olive oil. Heat oil, add new potatoes, whole or quartered carrots, thickly sliced or quartered onions and celery stalks. Quickly sear and remove from skillet. Spread Suan’s® Scotch Bonnet Flavor Sauce over each side of roast for desired flavor and spice. Add roast to pan and sear quickly on each side. Add 2 to 3 cloves of crushed garlic to top of meat, and return vegetables to pan. Top with 2 to 3 tablespoons of Suan’s® Scotch Bonnet Sweet Tomato Jam. Cover lightly and roast at 250 degrees for 2 to 3 hours. Tasteful tip: This makes such a rich sauce that I do not add any thickening to the drippings but serve au jou on the side. You can also use a less expensive cut of meat as the natural pectin in the peppers act as a tenderizer. Mix flour, salt and cheese well. Cut in butter and cream cheese. Add chopped herbs, if desired. Divide into 4 equal balls. Wrap in waxed paper and chill 2 hours or overnight. Brown meat and onions. Add garlic at end of cooking. Add Suan’s® Scotch Bonnet Sweet Tomato Jam and mustard. Simmer for 10 minutes. Adjust flavoring to taste. While meat simmers, roll out dough. Cut into desired rounds (small for cocktail size, larger for entree size.) Place small amount of meat mixture in the middle of crust, fold over and press edges with fork to seal. Bake on ungreased pan for 20 to 25 minutes in 350-degree oven. Tasteful tip: These freeze very well and are great to have on hand for entertaining, a quick snack or meal! After assembling empanadas, layer in resealable plastic bag (use wax paper to separate layers) and freeze for later use. Can be thawed and baked or baked from frozen state. Also try this recipe for Suan’s® Mango Chicken Empanadas. Mix beef, Suan’s® Scotch Bonnet Sweet Tomato Jam, blue cheese and minced garlic together. Form into 4 equal patties, wrap with bacon, and secure with toothpick. Grill as if a filet steak to desired doneness. A dash of hot sauce may be added to meat mixture, if desired. Makes 4 quarter-pound patties. Follow directions for Poor Boy Filets. You may want to pre-cook the bacon a little so not to have under-cooked bacon. Mix all ingredients together except the bacon, form into 4 equal patties, wrap formed patties with bacon, secure with toothpick. Grill as if a filet steak to desired doneness. REMOVE TOOTH PICKS BEFORE SERVING. Makes 4 quarter-pound –patties, serve on toasted buns topped with Suan’s® Scotch Bonnet Pepper Relish. Toast an English muffin. Add a thin slice of cooked ham or Canadian bacon, grated smoked Gouda cheese, and a poached egg. Top with Suan’s® Scotch Bonnet Sweet Tomato Jam.